Orthodox theologians have always seen the triple “Holy, Holy, Holy” as pointing to the Trinity. Or in the Book of Psalms the church has always seen the “word and breath” as referring to Jesus Christ and the Holy Spirit. We see here that Abraham addresses the three angels as “thy”. We no longer use this word in modern English, but it is in the singular. This distinction exists in many languages between the singular you (thee) and the plural. So, we see here clearly that Abraham is addressing the three angels as “Thy” in the singular. However, in the next verse Abraham addresses them as You in the plural. Orthodox theology has always seen this alternation between singular and plural as a prefiguration of the Holy Trinity. Obviously when Jews read the passage they do not see a reference to the Trinity. But when when the Christians read it, we read it in light of the New Testament. In other words, for us Christians, it is the theme in both Testaments. This passage has also influenced iconography. We cannot draw an image of God the Father, because the Father is invisible and of course, the Holy Spirit cannot be depicted as a human being. 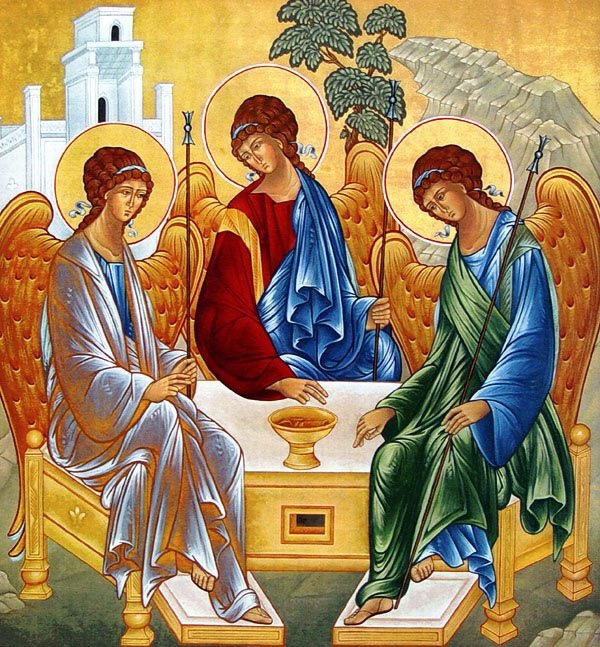 Therefore, this icon often depicted in this passage has become the standard icon of the Trinity. It has to be admitted that one sometimes sees icons which depict the Father as an old man. This kind of icon is not “heretical’ but it is a later development. Probably the greatest icon of the Trinity is Andre Rublev’s, made in the 15th century. It is now in the Tretyakov Gallery in Moscow and has influenced the making of Trinity icons ever since. This entry was posted in Church Services, Sermons on February 24, 2019 by gldstrm. We Christians are monotheists, meaning we believe in one God. This is a belief we share with Jews and Moslems, as well as some other religious systems. However, there is a big difference. We say God is one but also three. God is one, but the Son and the Spirit are also God. For Jews and Moslems this is either nonsense or blasphemy, and they often claim that we are polytheists. However, we are simply being faithful to God’s revelation to us as expressed in the Old and New testament. Others, even some Christians, would say that this belief in the Trinity is a result of pagan religion or philosophy influencing the simple message of love of God and neighbor. In other words, the fatherhood of God and the brotherhood of man. Still other critics will say that this belief was imposed on the Church by power-hungry bishops or emperors, but once again we say that we are being faithful to the one God who as revealed Himself to us as Trinity. Here, after the resurrection, Christ is telling the disciples that the belief in the Holy Trinity is the basis of Christian faith. So, we Christians believe that the New Testament clearly teaches the doctrine of the Trinity. But what about the Old Testament? Certainly, when the Jews read the Bible they could not find any mention of the Trinity here, and frankly the Jews consider this interpretation of the Bible to be totally wrong. Now it has to be said that the Trinity is not present in the Old Testament. However, from the earliest days of the Church the Christians found hints about the Trinity even in the Old Testament. And we must remember that when the Apostles went out to preach, the only Bible they had was the Old Testament and they found the Trinity in that book. This entry was posted in Church Services, Sermons on February 10, 2019 by gldstrm.